Could the problem be the FET. This type of FET varies enormously in characteristics from one to another. I went though a period where I almost stopped using FET's for years because of the huge variation in performance. My suggestion is that before you give up totally try some other FET's for the main transistor. Good luck I know how you can feel after putting in quite a bit of work and then not finding why something does not work. Thanks for the suggestion, Mark. I do have several more BF245 and I have some alternatives like 2N3819, J310 that I could try. I don't unfortunately have a FET tester that would allow me to look at their characteristics. Generally speaking tracked Veroboard, whilst fine for audio and digital applications, causes problems in RF projects due to stray capacitance between traces. I would expect this effect to be particularly acute at VHF where even very small stray capacitances can alter circuit (non)performance significantly. Before you consign it to the 'failed projects bin', why not try building it 'ugly style' over a groundplane? Julian - since posting my last comment I have looked at the article on VK2ZAY's site and I noted with interest that he cites specifically having a number of problems with stray capacitances. This reinforces my view that this is where your problem might lie - that and getting the coupling right between L1 & L2, which also seems to be a critical area. If it was easy, it wouldn't be any fun....!! I've rebuilt it now on a piece of plain copper board as a ground plane, minus the RF stage (to rule out over-coupling as an issue) and it still won't regenerate. Apart from trying another FET in case the one I used is no good I really am out of ideas on this now. I think this is one project it really would be best just to forget about. Julian - I've been messing around with the VK2ZAY circuit shown and demonstrated at http://www.youtube.com/watch?v=DG_lh_x92e0 Worked first time and very sensitive. it's not a lot different to the G3XBM circuit. Though I found that it was easier to get best sensitivity without the RF preamp and with the antenna applied via 5pF to the source. Now here they solved the problem by feeding the signal by a capacitor! Hi just NEVER give up. U made and it MUST work!! I think there should be a magnetic coupling (OR loose coupling) between L1 and L2!! 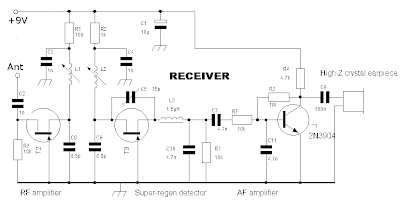 Look at the circuit T2 is working as a tuned RF amplifier to the FM band. 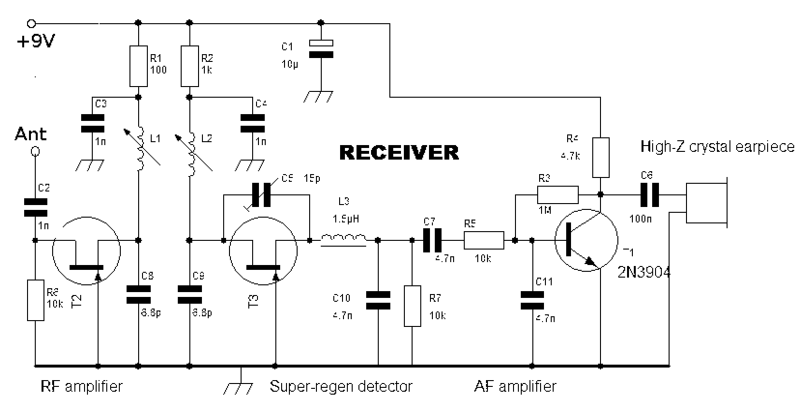 T3 is a super-regenerative amplifier. C5 is the regeneration control (changes the amount of feed back). L3 is an RF choke. The audio transistor is a detector already. The signal should be injected to the T3 circuit! I looked at Fredbox circuit also, and check it it seems that he is doing the magnetic coupling there. I am interested to know... Good luck.